Mattel Italia released two Barbie dolls modeled after European astronaut Samantha Cristoforetti during an event on Oct. 11, 2018. The agency and Mattel, the company that makes Barbie, partnered to create two Cristoforetti-look-alike dolls in honor of Barbie's 60th "birthday" this year, according to a statement from the ESA. One of the dolls wears a stylized reproduction of NASA's Extravehicular Mobility Unit, the suit that astronauts wear on spacewalks, and the other Barbie wears a blue ESA flight suit complete with patches from the agency. Mattel Italia debuted these two unique Barbies at a special event on the International Day of the Girl, Oct. 11, 2018. Last month, the Barbies appeared at the International Women's Day Gala of Professional Women International Brussels and at the Elle magazine Power Girl event in Paris. Unfortunately, Mattel isn't selling Cristoforetti Barbies to the public, at least not yet. But the company said it hopes that seeing a real-life female astronaut in doll form will help inspire young girls to dream big. 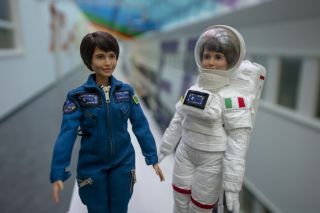 The ESA's Communications Partnerships Unit collaborated with Mattel Italia to use these Barbies in promotion of the company's Dream Gap Project. Mattel announced the Dream Gap Project after an academic study in 2017 found that by age 5, girls already tend to think they're not as smart as boys. "Research shows that children pick up on cultural stereotypes at a very young age that suggest [that] women aren't as smart as men," Mattel representatives said in an online description of the project. They cited research finding that girls are three times less likely than boys to receive a science-related toy. And as they grow older, girls tend to lose their belief that they can someday be an astronaut or work in computer programing or do any of the other jobs culturally associated with men. "One of ESA's goals is to be a source of inspiration for all of Europe's citizens," ESA Chief Diversity Officer Ersilia Vaudo said in the agency statement. "ESA is proud to be associated with this initiative, fighting stereotypes and encouraging girls and young women to pursue their dreams, whatever they may be." Cristoforetti is a wonderful role model for aspiring astronauts. Between November 2014 and June 2015, she spent 200 days aboard the International Space Station. This was the longest time a European had ever spent in space. ESA astronaut Alexander Gerst has since spent 351 days in orbit. And Cristoforetti said she's proud that her likeness could inspire young people to dream big. She said in the ESA statement that she's happy not only that today's Barbies reflect a wider range of body types and skin tones, so that many more girls can see themselves in their toys, but also that Barbie has a rich range of occupations. "I hope this will help girls and boys to imagine their future without being constrained by artificial limits that have no place in our time," she said. Although girls won't be able to take a Cristoforetti Barbie home, they can add an astronaut Barbie to their collection. In honor of the doll's 60th birthday, Mattel revamped several career-focused Barbie dolls, including astronaut Barbie. And in the fall of 2019, Barbie is getting a new astro-related career. In partnership with National Geographic, Mattel will launch an astrophysicist Barbie, who comes with a star chart and telescope. Follow Kasandra Brabaw on Twitter @KassieBrabaw. Follow us on Twitter @Spacedotcom and on Facebook.